On March 29, 1951, the 23rd Academy Awards were held at the RKO Pantages Theatre in Hollywood, California. The True-Life Adventure In Beaver Valley (also known as simply Beaver Valley), scored Walt Disney Productions the Academy Award for Best Short Subject (Two-Reel), Disney’s only win this ceremony. It was the second of five eventual wins for the studio in this category. The featurette focused on a beaver as he lived his life in a pond area, and his interactions with other kinds of animals, including a moose, deer, and raccoons. The featurette would also go on to win the Golden Bear for documentaries at the 1st Berlin International Film Festival. Posted in Uncategorized and tagged 1950s, Academy Award Nominated, Academy Award winning, Documentary, Live Action, True-Life Adventure. Bookmark the permalink. On October 7, 1918, Norman Palmer was born in Santa Ana, California. After graduating from Hollywood High School in 1937, he applied to the Walt Disney Studios, joining as a projectionist in 1938. Soon after he arrived, Palmer was transferred to the editorial department. His early career was cut short by the onset of World War II, when he joined the Field Photographic Branch of the Office of Strategic Services in Washington D.C., editing films. He was soon sent overseas, taking aerial photos over Europe. 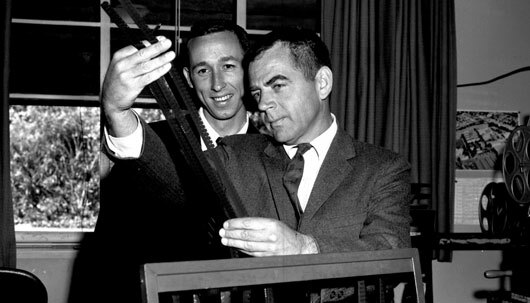 After the war, Palmer came back to Disney, where he continued editing films, including Melody Time and Make Mine Music. When the studio stared working on the True-Life Adventure series, Palmer was brought in to edit the films, including Academy Award winning The Living Desert and White Wilderness. It was Palmer’s special skill with editing and attention to detail that brought attention to these nature documentaries. Palmer also brought his editing skills to several Disney television series. After 45 years with the company, Palmer retired in 1983. He was inducted as a Disney Legend in 1998. Palmer passed away in 2013 at the age of 94. Posted in Uncategorized and tagged Animated Feature Film, Births, Disney Legend, Documentary, Live Action, True-Life Adventure. Bookmark the permalink.